Easter time means cute wire egg holders from Target’s dollar section! Such a good idea! Mine always rolls away and hides when I’m not looking. Oh my God this is genius! 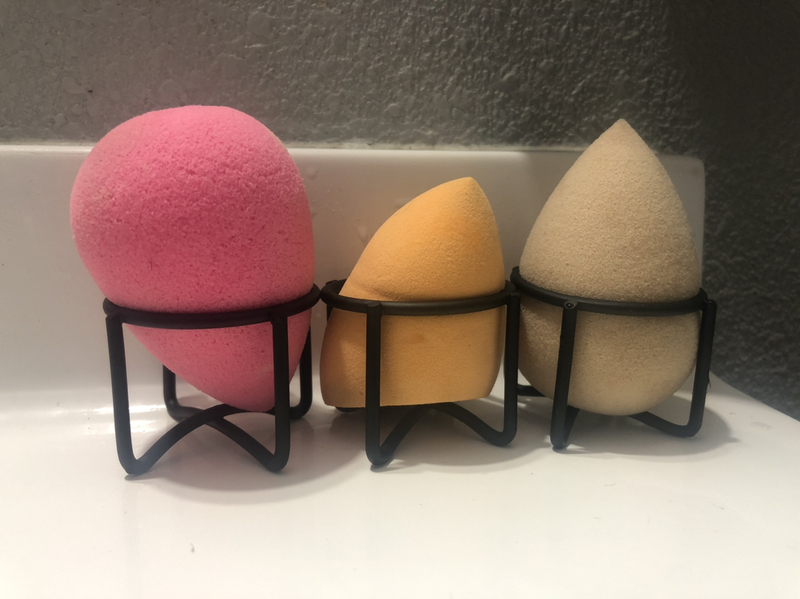 I never have a place to put my sponges! Such a cute idea though! • If you are posting a look, haul, or flatlay, please be sure to include a product list, complete with shade names within 20 minutes of posting. • Also, please ensure your pictures are not edited or filtered. This includes automatic beauty modes found on many phones and newer cameras. • Lastly, our Helpful Guides for Navigating MUA in the sidebar explains some of the basics of the community as well as commonly misinterpreted rules. Is your post just a search away? Before you make a post, search with Reddit's search feature or use this handy customised Google search. I got an actual holder, its cute. They have really pretty glass ones too for a dollar each! They fit the juno&co blends too. This is the only reason we are going to save Reddit during the apocalypse. 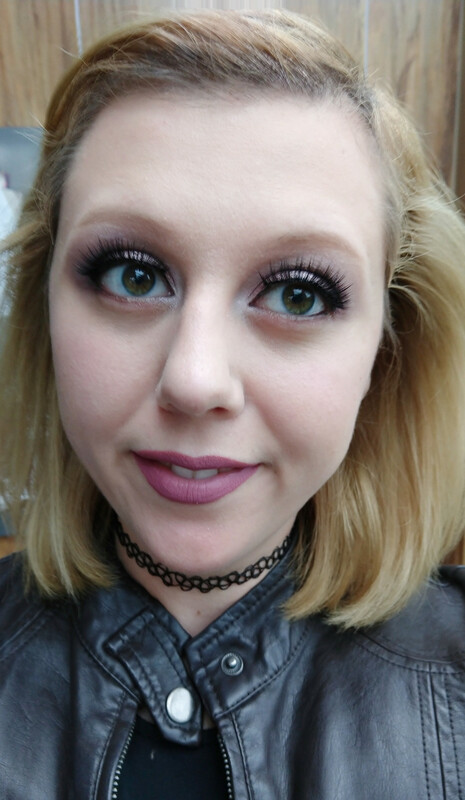 Bought some new goodies so here is a full face! This actually made me think of a yellow rain coat and raindrops more than a watermelon, but either way I love it! 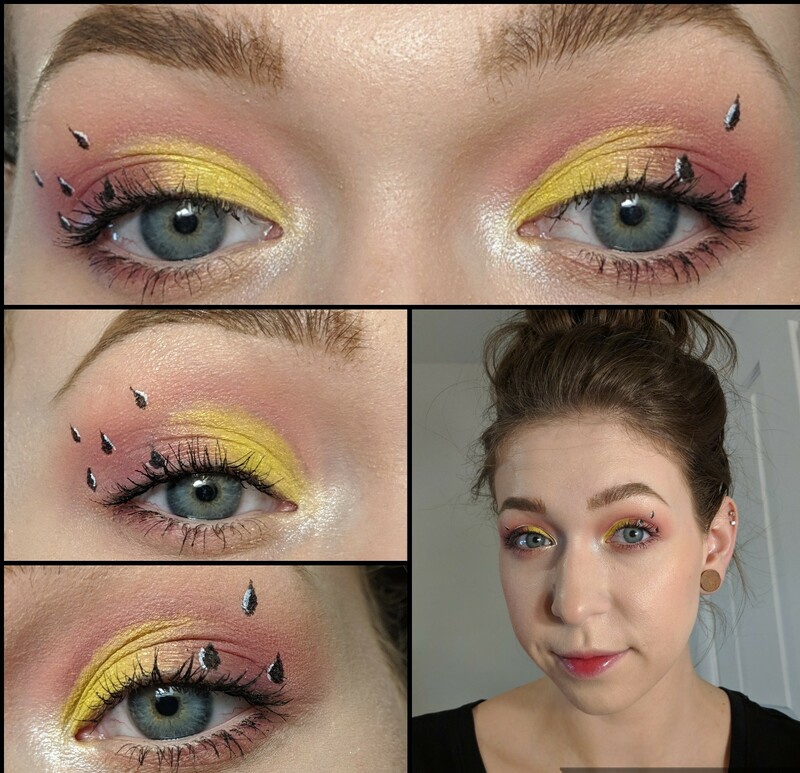 How did you get the yellow to be so vibrant? 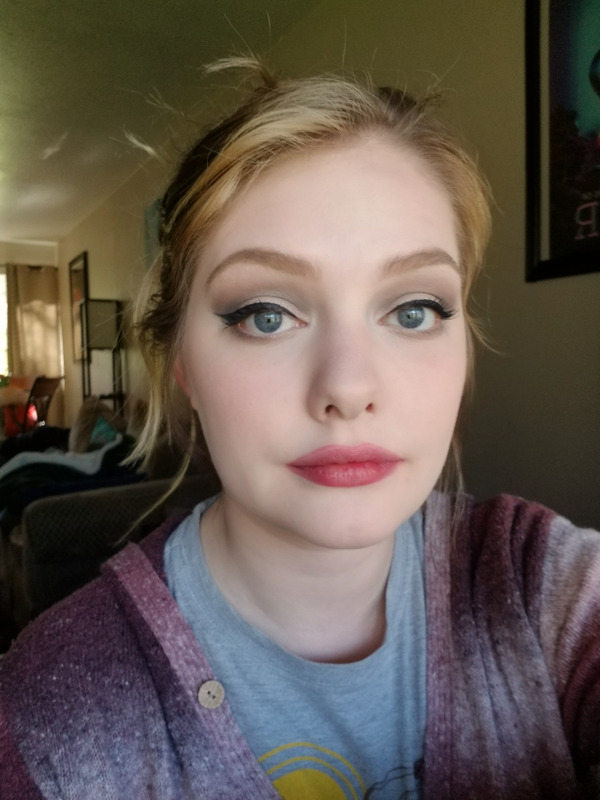 Love the base and eyebrows, it may be the lighting but your lips look over-lined in an obvious way, maybe try a shade darker on the lipstick or lighter on the liner? I personally think the winged eyeliner is a little too large - particularly how thick it is across the lid that it overtakes the look. I think if you were to make it a little thinner (not necessarily shorter although you can plan with the length) it would do a world of good. Your lips are also pretty obviously over lined and although I like that the lipstick you chose isn’t too opaque, the sheerness is very pretty for a bridal look, either skipping the liner or picking something darker/more natural would suit you much better. Can’t tell if it’s the lighting or the colors used, but the eyeshadow is a little too cool toned for a bridal look and if it’s not the one you’re already using I would shoot for the neutral quad of the KVD palette and not the cool toned one. Not trying to be harsh, sorry if that’s too much! Upgraded to pure luxury (LOL) | I highly recommend a fan for drying your setting spray! I see so many BGs on YouTube fanning themselves after spraying setting spray, and I'm nothing if not a follower so I had to try. 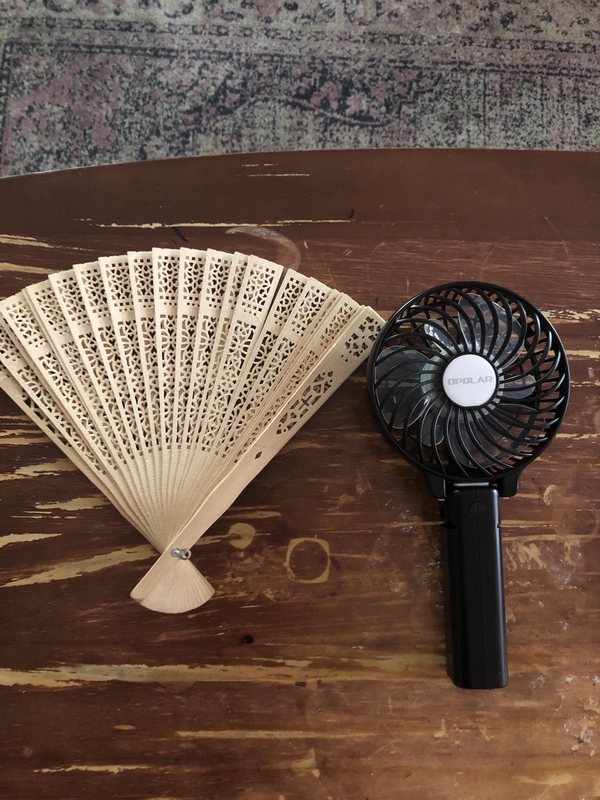 For the past year I've been using the handheld fan on the left that was passed out at a particularly warm outdoor wedding one summer (brilliant idea btw), and it's been great. But I use it daily and decided to treat myself to the cool "face fan" on the right. It was like $15 on Amazon and I'd seriously recommend it! I'm one of those drench your face in setting spray kind of people. Daily. It can take quite a while for it to dry down. But now - only seconds! Haha. Anyway this post is mostly just for fun, this is totally not a necessity but makes me happy. I was just looking at these on Amazon today. Stop reading my mind! Such a clean look! Your base is so good, lips and eyes are perfect. But your eyebrows dip down before going into your arch and tail, which creates kind of a "villainous" look. I think if you fill in that dip on each brow, so the brow doesn't curve up into the arch but just goes straight back and then falls into the tail, it might not look as facially dynamic for when your face is at rest. I plucked half my eyebrows off because the ends weren't working with me lol. But I'm still fairly new to doing them. I have naturally thickkkkk eyebrows but they lack shape. 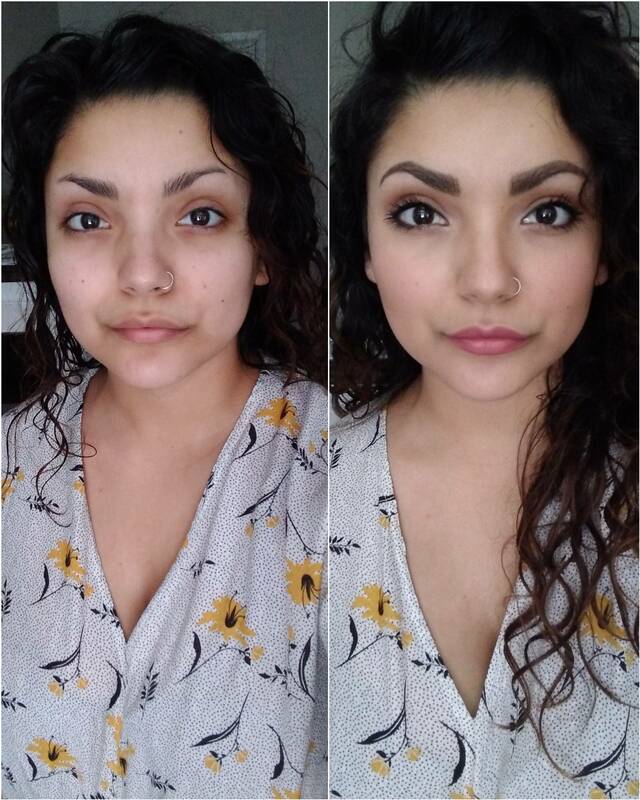 I've been wanting to switch to powder foundation for an everyday look. Let me know if y'all have a favorite! Your eyes jump out when the makeup is on them, they look twice as big! Laura Geller Balance n Brighten powder foundation is my HG! Oh wow! You look gorgeous. Your eyebrow shape fits your face so well! Your brows and blush are so flattering! 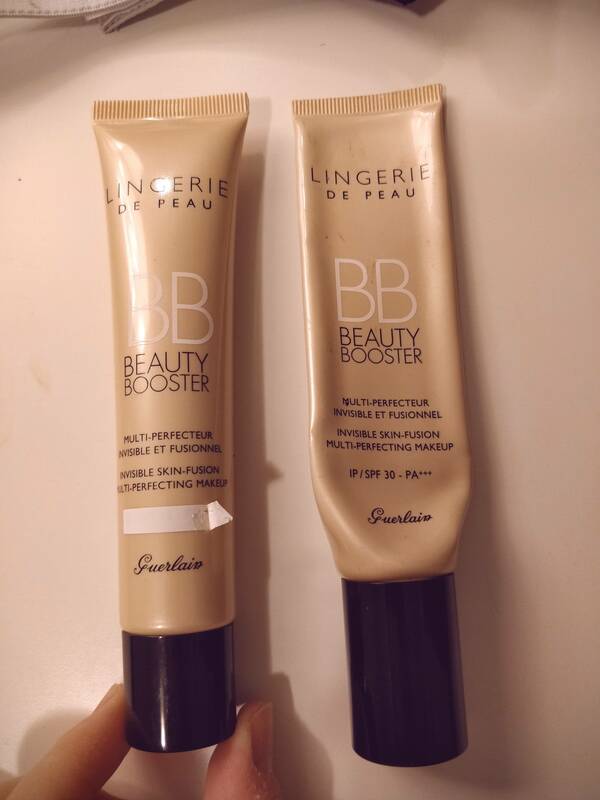 Did Guerlain remove SPF from their Lingerie de Peau BB Beauty Booster? Here's a pic of the last one I bought and the new one; SPF label has a sticker on it! Try contacting Guerlain; they should be able to answer this authoritatively. I purchased Guerlain's L'essentiel foundation a few days ago and it also had a sticker over the SPF. The woman at the counter said the SPF rules are stricter in Canada so they have to cover it since the packaging is international. Where did you buy it? On the Guerlain site the tube looks like it does on the right. Is there an expiration date stamped on it.? Makeup for when I'm trying to elicit a compliment from my mom. Am a Mom. You look lovely dear. Er excuse me how did you make your naso-labial creases disappear?? Seriously, how did you do that? I've always wanted brown eyes - yours are so gorgeous! Love this look. What's your skincare routine?? You have great brows naturally and made up. The brow fairies blessed you. Do you do tutorials on YouTube? omg your tear troughs just DISAPPEARED. MUFE concealer, you say?! Great job! Your hair is pretty too. I'm not a mom, but you look proper stunning! Holy cow! Just an absolutely amazing look, top to bottom! I feel your title so hard. My mom always makes comments if I don't fix myself up. 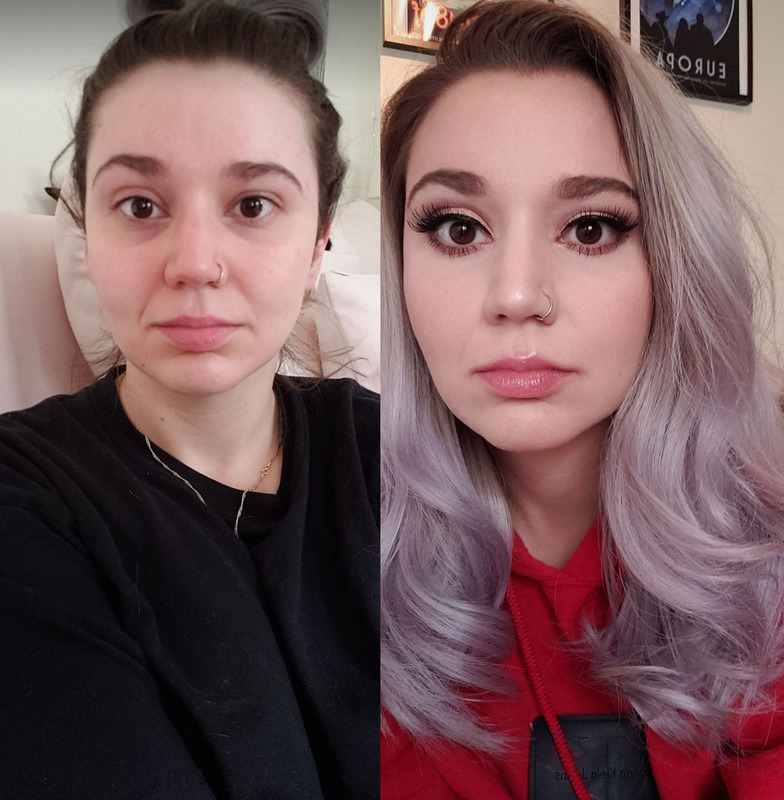 I’m a mom and would like to compliment you on both your before and after looks! Beautiful both ways! You have beautiful skin 💗Love to know your routine! A true mood. Also, I’m someone’s mom and you look great. Your makeup is fabulous but I’m obsessed with your hair! Gorgeous! I’m a mom. You look stunning! Hey uh any advice on makeup around nose hoops? Can’t figure it out!! so pretty~ you have such naturally full lips, I'm jealous! You get my upvote! GORGEOUS! 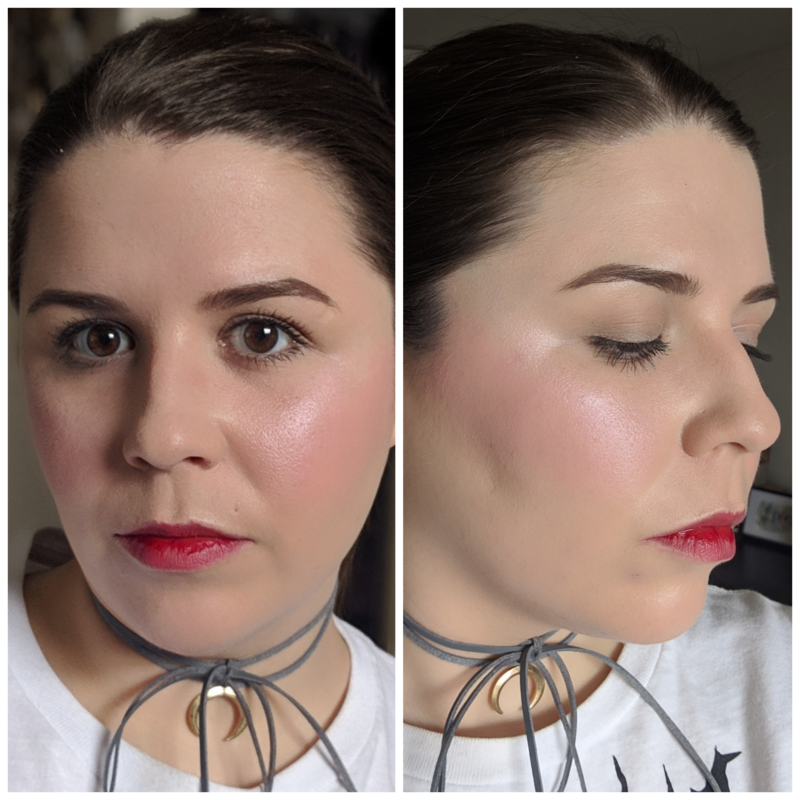 Dewy skin attempt. Mix of Western and Korean products.